Knowing that the film produced by Ghibli Studios, “Ponyo” was inspired by the town of Tomonoura, every time I hear the name of any fish, I can’t help but wonder if that fish appeared in that film. One enters town by way of a narrow two-lane road that meanders through this landscape. With hints of sea breeze coming from the harbor, the beautiful townscape has been around since the Edo Period (1611-1868). 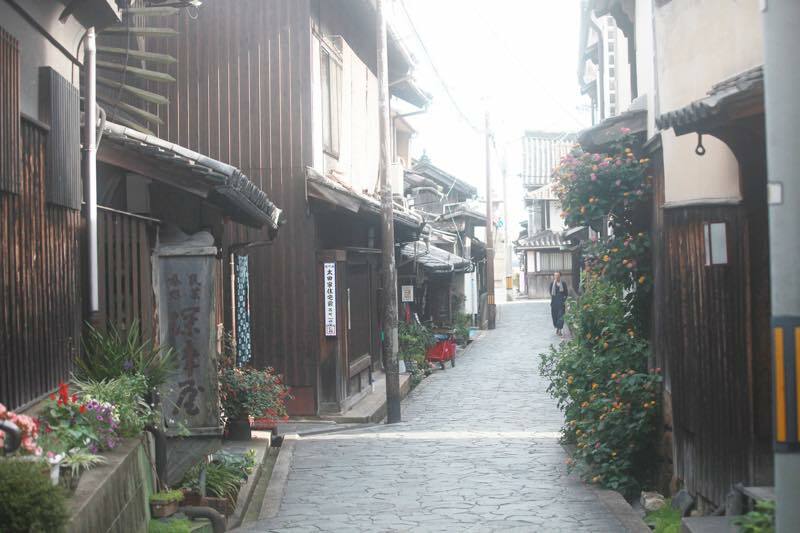 This town 30 minutes by bus from the city of Fukuyama has a warm local feeling that visitors yearn to encounter. The diner, Shokujidokoro Otebi is a small but cute place. The building retains its late Edo period feel, with the owner Mutsuko-san, born and raised in Tomonoura, noting, “My younger brother is a carpenter and left the exterior as it is while remodeling the interior of the diner.” She once left her hometown but later came back to establish her restaurant. 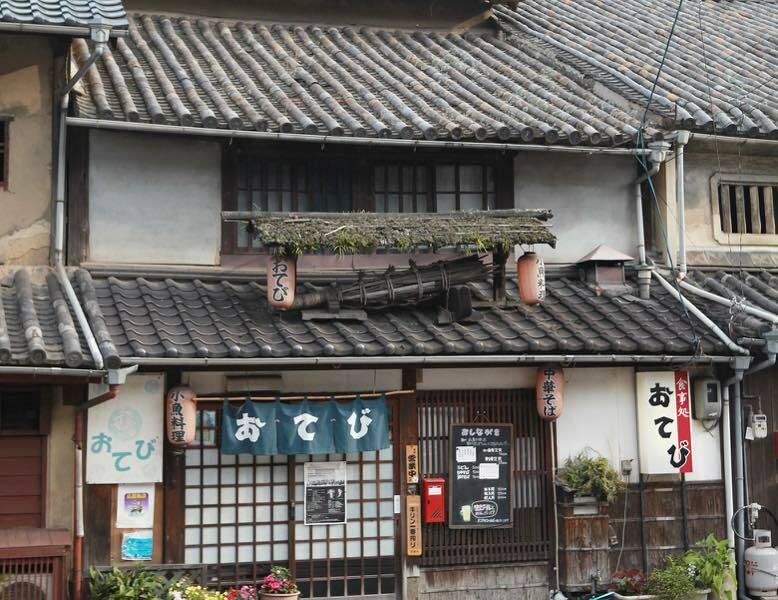 The restaurant, now loved by locals and tourists alike, draws its name from the Otebi festival dating back to the Kamakura Period (1185-1333). The specialty of her diner is the local fish, which locals tend to refer as“insignificant fish”. By the way, these, “insignificant local fish” as the locals say are a mixed bag of different species that can be troublesome to identify, thus locals tend to use the word “kochi” to refer to these different small fish. Each fish is actually completely different but the locals just lump them all together as kochi (I saw 2 to 3 different species of kochi before me). These different fish varieties do not have any specific names or prices, and don’t appear in normal markets either. The locals feel that these types of fish are “unsuitable to be served to guests” and there aren’t any places that offer them, making Mutsuko-san’s shop truly special. Mutsuko-san made me a simmered dish using today’s freshly caught large kochi fish. While adding some cooking sake and soy sauce, Mutsuko-san noted, “Sugar? Oh, I don’t add that,” as she placed the kochi fish in the boiling sauce. Simmered a few minutes without moving the fish, the result is delectable with a fine seasoning. She also prepares the other smaller kochi and gigi that were caught in the morning by the fishermen, always air drying the fish by exposing them to ocean breeze for a few hours prior to seasoning and frying them. This extra effort aids in enriching the flavor from the bones to the head and creates a taste distinct to the town of Tomonoura. Mutsuko-san prepares all the dishes in the morning. By the afternoon, all the dishes are lined up on the counter and are remarkably impressive. It could be that that the region is rich in smaller fish, but I’ve never seen so many different types all at once. Plus, it’s critical to use the freshest fish so that the finest taste can be retained when dried. While eating the dishes Mutsuko-san prepared from the fish of Tomonoura, I begin to yearn for a glass of beer, even though it was still daytime. By evening when the shop opens, there are usually customers that come by to grab a drink. They talk nandemonai (insignificant) matters and then say, “See ya tomorrow” and leave. “In the old days both adults and children often played together. The sea was much more beautiful then compared to now, so it was really fun. Even at this age, all of my old classmates would gather every month, and twice every year we would all go on vacation; that’s how close we are. Regardless, I love this place where you can casually call on anyone easily now just as I could then,” Mutsuko-san reflected. She is the one that takes charge in calling on all her old classmates when getting together. “I make sure to call everyone,” she emphasizes. An essential part of the restaurant is the way she even remembers each customer’s preferences so that when they come back again she can provide dishes they like. Nowadays, tourists from abroad come to Tomonoura to taste this local cuisine. There’s no denying that Tomonoura has good fish. While Mutsuko-san may call them namdemonai sakana (insignificant fish), she will always continue to make her dishes with them.